In some cases involving the Apple Double format, moving a file to a different file system will cause the prefix "._" to appear on a file name. The files "._" are invisible when you're trying to list the file even with "ls -al" but you can see them when you compress a file. Here's how to copy the files found in the result of a search to a specified folder. Here's a simple example that shows how to find the value of different groups in a string with a regular expression. I've found a good site on e-commerce infographics. I've found a good article concerning the best PHP frameworks of 2011. It worth the time of reading it! I've found a good tool to test Java Regex online. Unlike Firefox and Safari - Internet explorer requires the DOM to be fully loaded before it can provide a peaceful execution of ExtJS code - you will face operation aborted errors otherwise. I declare a DIV container for an ExtJS based tab panel and immediately afterwards provide the required code. Assuming more HTML markup follows after , this code will produce random operation aborted errors in internet explorer 6 and up. Sometimes it will load just fine while other times it will err out while you being able to see your page rendered - you will be unable to interact with the page and will be redirected to the default error page once you will click the ok button on the popup dialog box. This error is not specific to ExtJS - this is a general bug with internet explorer and will occur whenever a DOM node is tried to be manipulated before the whole DOM structure has been read in by the browser. For example you will also face this issue with google-web-toolkit. Ideally you should consider moving all your code into JS files to speed up page loads due to caches. We got this error because the is no remaining space on the drive. After freeing some space on the drive, everything goes well. Here's a mapping between commons EDI & EDIFACT transactions. Hi here's a list of all EDIFACT documents. 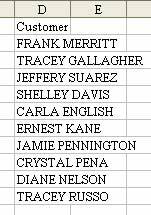 The JD Edwards EnterpriseOne database does not contain any table or field name aliases with meaningful English descriptions. This lack of descriptions creates an issue for application and software developers in accessing the Table File Definitions and Field Descriptions contained in the JDE Data Dictionary. Without access to the table descriptions and the field descriptions, developers are not able to easily navigate the data needed for developing applications or reports. Normally there are only two ways to get this information; both native methods of accessing table and field description information are inside the JD Edwards application. This requires that developers be trained in JDE to access the information they need. The first native method of access is to log into the JDE Fat Client and search through the Data Dictionary for the specific field aliases and/or table names. The second method is to pull up the Table Browser inside the EnterpriseOne Web Application, or Fat Client, and browse the data table, toggling between the field names and the field descriptions. Most developers prefer to stay inside of SQL, or their chosen Integrated Development Environment (IDE), while maintaining access to all the information necessary to identify JDE fields and tables. Additionally, the ability to see field lengths and data, to search for specific field aliases throughout JDE, and to to perform wild card searches for field descriptions, aliases, data types, and other information in the Data Dictionary, from the development environment, is a huge time saver. I have developed a simple table function, called TFD (Table File Descriptions), which allows developers to search and display table file descriptions and JDE Data Dictionary information with a SQL command inside of a query window of your chosen IDE. How it works is simple. You just type a select statement and use the TFD() function in the “From Clause”. The TFD() function will return a table result based on the table name passed in, and any additional “Where Clause” constraints. Type svn resolve --accept working -R .
For Dashboard - change the mouse section to either Nothing (-) or add modifier keys to the mouse click (eg. hold any combination of Command, Option, and or Shift when choosing what mouse button to use). To the right of your data, copy the heading from the column where you want to find unique values. 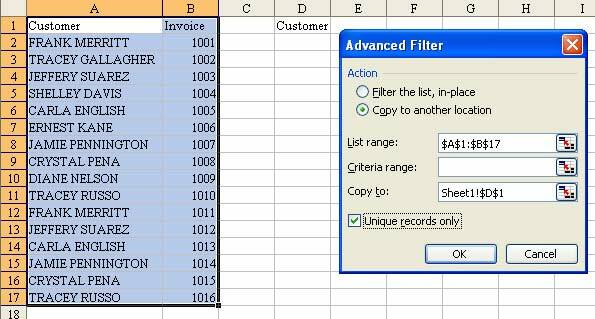 In Excel 97-2003, choose Data - Filter - Advanced Filter. In Excel 2007, choose the Advanced icon from the Sort & Filter group of the Data ribbon. Excel will provide you a unique list of customers in column D.
The COUNTIF function can count how many records above the current record match the current record. The trick to making this work is to use a single dollar sign in the reference. If you are entering a formula in C2 and you reference A$1:A1, this is saying, "Start from the absolute reference of A1 and go down to the record above the current record". When you copy this formula down, the first A$1 will stay the same. The second A1 will change. In Row 17, the formula in C2 will read: =COUNTIF(A$1:A16,A17)=0. Once you have entered the formula in C2 and copied it down to all rows, you should copy C2:C15 and then use Edit - Paste Special Values to convert the formulas to values. You can now sort descending by column C and the unique values will be at the top of the list. A pivot table is great at finding unique values. This is the fastest way in Excel 2000-2003. Choose Data - Pivot Table and Pivot Chart Report. 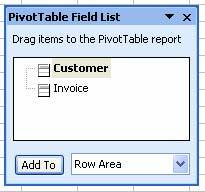 In the Pivot Table Field List, click on the Customer Field. Click the Add To button. 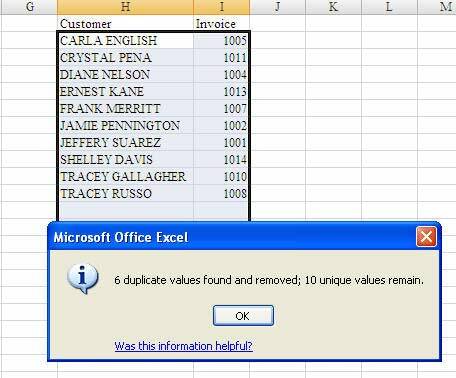 Excel will show you a unique list of customers. 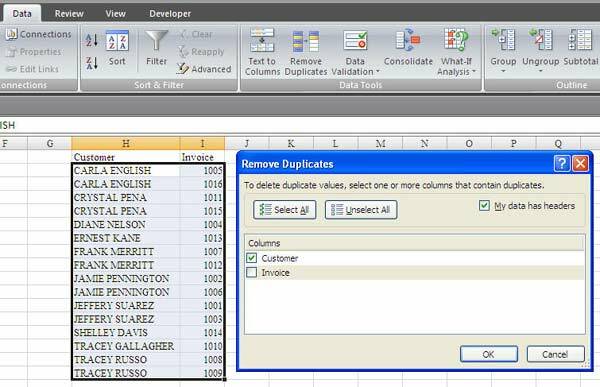 Excel 2007 offers new methods for finding duplicates. Select the range of customers. From the Home ribbon, choose Conditional Formatting - Highlight Cells Rules - Duplicate Values and click OK. 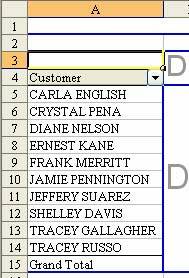 If a name is found twice, Excel will highlight both occurences of the name. You would then want to sort all of the highlighted cells to the top. Click any field in the customer column. Click the AZ button in the Data ribbon. Find a cell that has the red highlighting. Right click the cell. Choose Sort - Put Selected Cell Color on Top. This method is highly destructive! Make a copy of your dataset before you do this! From the Data ribbon, choose Remove Duplicates. The Remove Duplicates dialog will give you a list of columns. Choose the columns which should be considered. For example, if you needed to remove records where both the customer and invoice were identical, check the box for both fields. In this case, you are trying to get a unique list of customers, so choose only the Customer field. Excel will delete records from your dataset. It will report that n duplicates were removed and nn records remain. As you can see, there are many methods for dealing with duplicates. 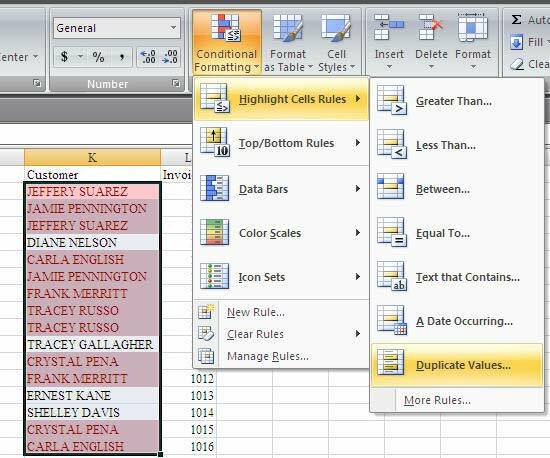 Excel 2007 adds two new tools to your arsenal. For an unknown reason, this morning Firefox can't load SSL web site. I've reinstalled Firefox but the problem was still there. Right-click on "My Computer" and select Properties. Click on the "Remote" tab. Under "Remote Desktop" (the bottom section), check the box labeled "Allow users to connect remotely to this computer". Go to the Start button, to "Control Panel". Open the "Windows Firewall" control panel. If you don't see Windows Firewall listed, make sure that you're looking at the control panels in "Classic View". On the "Exceptions" tab, make sure "Remote Desktop" is checked. On the "Advanced" tab, select "Local Area Connection" and press the Settings button. In the new window that opens ("Advanced Settings"), make sure that Remote Desktop is checked.